They have a couple of recent titles out on the market. 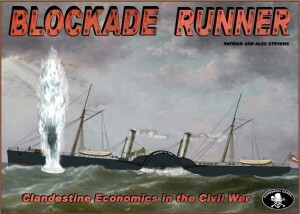 Blockade Runner is a Civil War era economic/resource managememt board game.You take the role of an entrepreneur trying to sneak crops and goods through the Union blockade. Popular Front is a Spanish Civil War ERA card-driven war game. It is different then most war games, as it has no dice or charts. It is more like playing Go meets Poker in a strategy war game setting. Numbskull Games also purchased the Conquest Company. This venerable gaming company, founded in 1972 by Donald Benge, was in limbo when Mr. Benge died in a car accident a few years ago. Numbskull has purchased the company and the rights to all the games, and are working to re-release some key titles. Grand Conquest is on sale now (though sold out in most places and they are shipping them as quick as possible) and the original Conquest game is planned next year. Vampire Werewolf Fairies is their 2011 product, coming by the end of April. It is a sequel to Zombie Ninja Pirates. 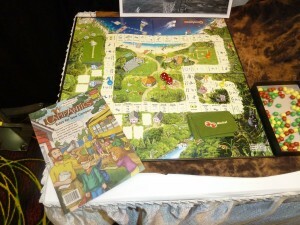 The games can be played independently or combined together for a SUPER-GAME. Gozer got some great comic artists for this series. They enlisted Phil Foglio (Girl Genius), John Kovalic (Dork Town and Munchkin), Randy Milholland (Something*Positive), Terry Moore (Strangers in Paradise), and Neko Pilarcik continued on from the original set. This game is the “flip side of trivia”. It is a trivia game with an educational/family orientation, that focuses on the important things you need to know in life, not esoteric knowledge. This game is designed for 2 to 8 players, ages 14+. The game topics include life skills, money, technology, health, everyday law, first aid, geography, civics, economics, and history. Finally a trivia game that I have a chance of winning! This was there first GTS and their game will be out around the end of March. Bereb has a new game called CampAntics. The idea behind the game is to capture all the fun and mischief of summer camp. This game has a focus of interactivity and social play. At each decision point, the game helps foster conversation and interaction between the players. To help younger players, they have made a comic book that helps teach them how to play in a fun and playful format. Then as players progress (or get older), there are additional rules that can be added to the game to make it more complex and strategic. This game can be played solo or up to 4 players. The age range is targeted for 7 to 14, with the nod to older players who will can play with the kids. Armstrong was at the show telling game companies about their consumer product testing services. This lab is certified to deal with CPSIA testing, and they have an interesting approach for companies. Armstrong partners with a Chinese logistics company, where the game manufacturer would ship its product for a 10 day holding period. In that 10 days, the logistics company selects random samples and ships them to Armstrong’s lab in the United States. The tests are processed within that 10 day period before the product is sent to the US. Therefore, there will be no surprises in customs once your game arrives. And in addition, they have partnered with an Insurance and Liability provider who will give a discount on their premiums if you use Armstrong’s services. With this discount you are close to getting the testing done for free. Cepia was showing off their new RoadZters game. 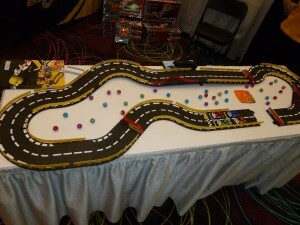 RoadZters is similar in play to their Bisikle game, although with race cars. The basic premise of the games is that you flick a specially designed marble (the ZBall) with your finger down the track. Where it lands, is where you move your car. Sounds simple? Well its not. There are obstacles, ramps, and of course, other cars in your way. And if you flick the ball off the track. Na, na, na, na na… Wipeout. This game can be played up to 4 players and is available now. My first experiences with serious gaming came from the Hero Quest board game. I then made the next step to the RoboTech RPG and a lunchtime meeting of AD&D Oriental Adventures. My interests now are pretty much the same. Boardgames and RPGS. Some of my favorites boardgames are currently Settlers of Catan, Battlestar Galactica, and Space Alert. For RPGS, it is Monte Cook's Cypher System. But I am always down for a good round of Dungeons & Dragons. Why Are Role-Playing Game Characters Superior to Real World Politicians? November 2, 2010 trask Comments Off on Why Are Role-Playing Game Characters Superior to Real World Politicians?